A nice surprise, this issue of DC SUPER-STARS devoted itself to reprints of the Flash. 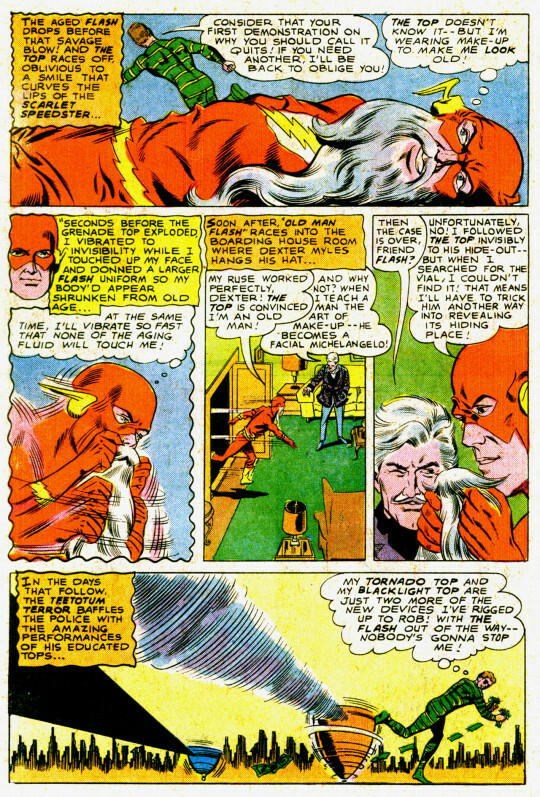 These apparently had been prepared for FLASH #235, which was intended as a Giant issue (and mentioned as such in the letters page of the preceding issue) but canceled at the last moment. There was also an interesting story here done for something else, as we’ll soon see. The book opened with a Flash yarn featuring the Top. It also turned on the idea of the central character undergoing a strange transformation, something that was almost a sub-genre at DC during the era in which it had been done. 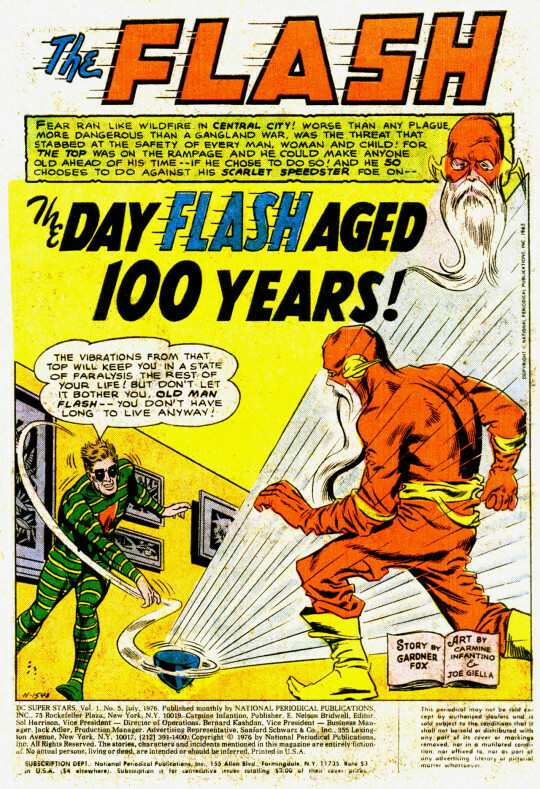 In this case, the Top seemingly is able to age the Flash into a decrepit old man, unable to run. This is, as it turns out a ruse on the part of the Flash to recover a stolen aging agent that the Top purloined earlier. And when it doesn’t work, the Flash changes up his approach, seemingly transformed into a mental giant of future evolution. When the Top recovers the serum in order to attempt to duplicate its effects on himself, Flash wraps everything up. It’s a decent story, though not great, and it looks as though it may have been drawn after DC shrank the size of the original art to the current size, as Carmine Infantino’s usual expansive vistas seem a bit claustrophobic throughout. 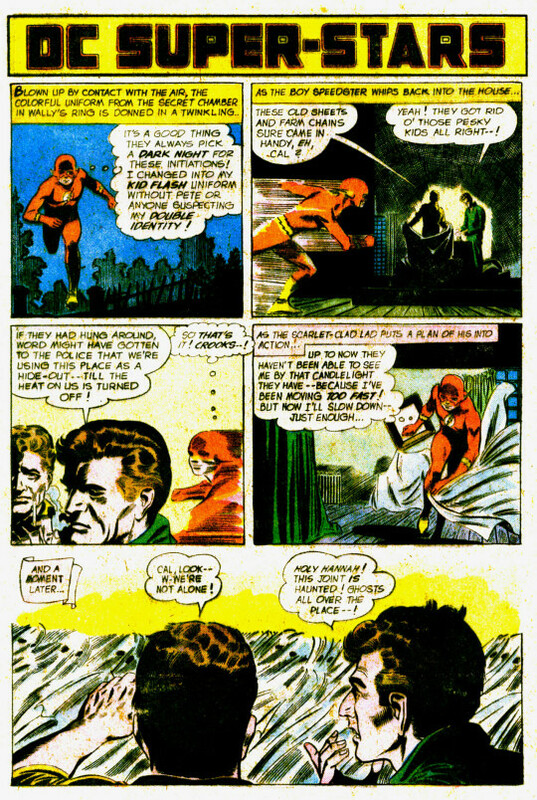 After a text page talking about the history of the three Flashes we get a Kid Flash tale next. 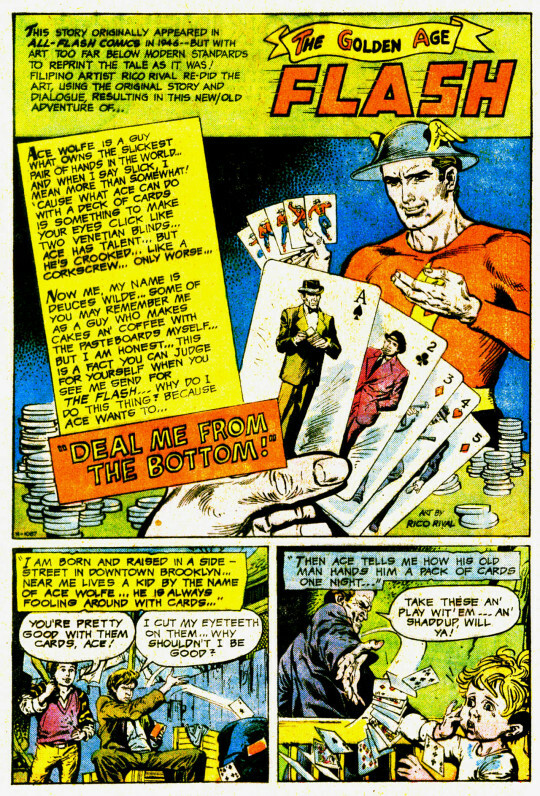 These Kid Flash stories were less super hero adventures than they were the silver age equivalent to teen-age adventure stories akin to the Rover Boys or the Hardy Boys. Very small-town, very low stakes, very much focused on rural life. 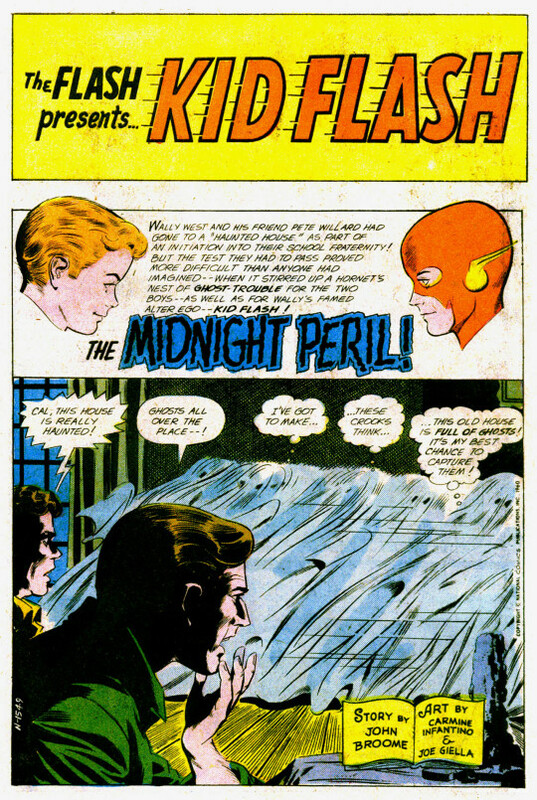 This one, in which Wally West pledges a fraternity by spending the night in a haunted house, is about par for the course. Of course, in true Scooby Doo fashion, the reason the house is seemingly haunted is because there are crooks using it as a headquarters, who dress up as ghosts to scare away interlopers. 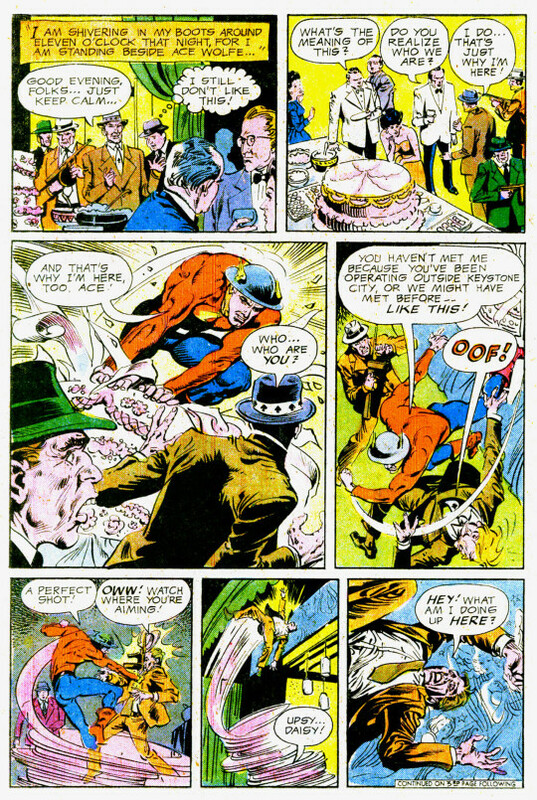 Kid Flash turns the tables on them, gets them locked up, and also saves his fellow pledge Pete Willard from peril. It’s a very pleasant story, expertly crafted. They don’t really make them this way anymore. The last story in the issue is a bit of an oddity, as it’s not quite a reprint. There were a number of Flash stories drawn in the WWII and post-WWII-era by Martin Naydel, a funny animal cartoonist primarily who wasn’t all that comfortable drawing super heroes. But the stories by Gardner Fox were still good. As an experiment, DC had Filipino artists (whom they’d hired to work extremely cheap) redraw a pair of these old stories as an experiment in producing work that could be printed affordably. This was the second of those two tales, reconceptualized by Rico Rival. The first had appeared in FOUR-STAR SPECTACULAR #1 which I had missed. By way of comparison, here’s the same page from its original printing. 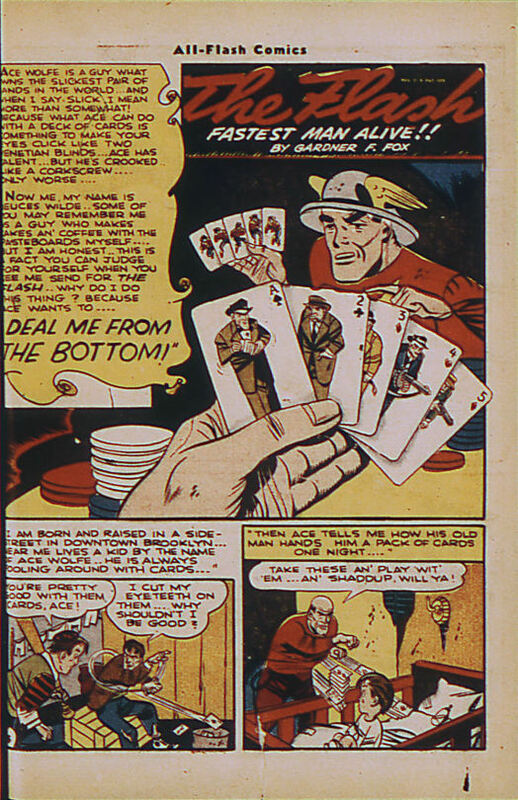 The story concerned recurring Flash character Deuces Wilde, a card shark, and his childhood friend Ace Wolfe who has gone on to become a gangster. The Flash sorts everything out, of course. The story was akin to a Noir B-movie (albeit not as dark) and was a real favorite of mine, In fact, inspired by the fact that the story had been redrawn by a modern artist, I took it upon myself to draw my own version. Unfortunately, I can’t seem to lay hands on my version so many years later. It must be said that Rico Rival did a very nice job on his rendition of this story. It probably helped that it contained relatively little actual super hero action and was more akin to a gangster film, as, like many of his contemporary Filipino artists who had been imported by DC, Rico wasn’t conversant with the idiosyncracies of depicting convincing super heroes. Regardless, he does a pretty cool job here, and I would have liked to have seen more.